The most grandest and biggest beer and music festival of the year was here. 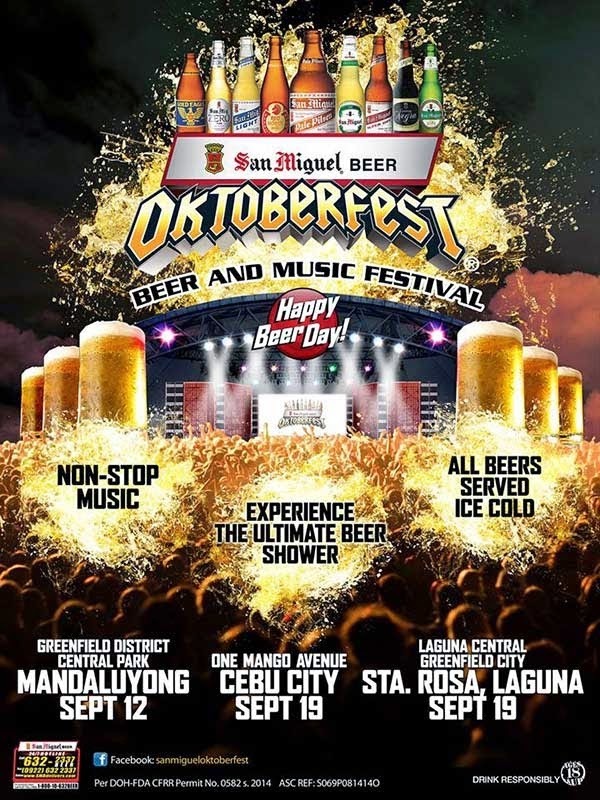 The San Miguel Oktoberfest 2014 was launched on Friday, September 12 at the Greenfield District Central Park in Mandaluyong. This is a non-stop 12-hour party with packed of San Miguel Beer and lots of performers such as, Ely Buendia, Pepe Smith, Slapshock, Greyhoundz, Razorback, 6Cyclemind, and Rivermaya. There are also the country’s top DJs namely, Mars Miranda, Ace Ramos, Deuce Manila and many more. You can buy tickets priced at P300 (with five cups of assorted beers) in manila area while P50 (with one cup of Pale Pilsen) in regional kick-off. For more #SMBOktoberfest2014 schedule related information, kindly bookmark this page and share to your joined social networking sites. Comments or suggestions about "2014 San Miguel Oktoberfest Schedule starts on September 12" is important to us, you may share it by using the comment box below.